I cannot take credit for the design of the Majestic Oak's logo; however, the community manager, knowing that I am a graphic designer, contacted me with a request to re-create the logo artwork as it had long been lost. As a member of the community, how could i say "no?" Following the re-creation of the logo, came the request for stationery design and then the coup de grâce, join the Board of Directors. That eventually lead to being elected President. Funny how a little thing like a logo request can snowball. 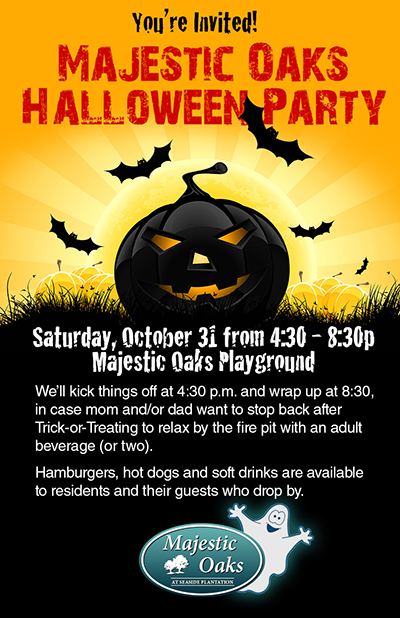 During years where Halloween falls in the right spot on the calendar we organize a community party. We'll stuff mailboxes with flyers, put up a few posters and even blast out an HTML email, courtesy of yours truly. 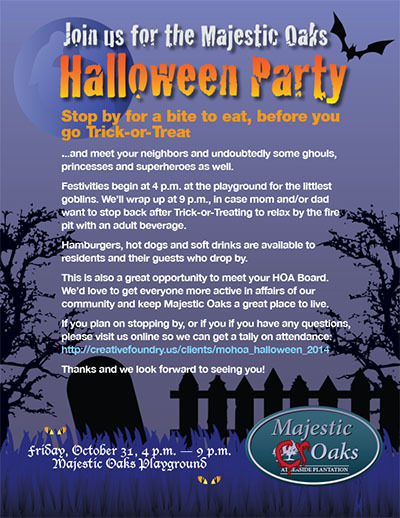 Halloween being my favorite holiday, I don't mind doing the invitations in the least — all pro bono. This same design was used in a poster (top graphic) as well as a web page and HTML email blast. Each year that avails itself to a party (the 31st falling over a weekend), I try and change up the look and feel of the invitations.